The City is the best, funniest, saddest, and most thought-provoking compilation ever assembled on the urban scene. James A. Clapp has arranged more than three thousand quotations—epigrams, epithets, verses, proverbs, scriptural references, witticisms, lyrics, literary references, and historical observations—on urban life from antiquity until the present. These quotes are drawn from the written and spoken words of more than one thousand writers throughout history. 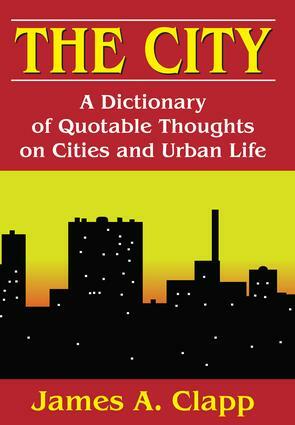 This volume, with contributions from speakers, poets, song writers, politicians philosophers, scientists, religious leaders, historians, social scientists, humorists, architects, journalists, and travelers from and to many lands is designed to be used by writers, speechmakers, students, and scholars on cities and urban life. Clapp's text is striking for its sharp contrasts of urban and rural life and the urbanization process in different historical times and geographical areas. This second edition includes four hundred new entries, updated birth dates and occupations of quoted authors, and an expanded and updated introduction and preface. Clapp also added new introduction pages for each section containing pictures and unique quotations. The indexes have also been expanded to include more subjects and cities. The scope of this book is international, including entries on most major and many minor cities of the world. It is noteworthy for its pleasures as well as its insights.